Trigger Point Therapy is used to reduce pain that results from hypersensitive muscles. Identifying trigger points is done by gently pressing on the surface of the skin, feeling the texture of the underlying muscle. Trigger points, trigger sites, or muscle knots, are hyper-irritable spots in the fascia surrounding skeletal muscle. They are associated with palpable nodules in taut bands of muscle fiber. It is made up of lactic acid, a normal byproduct of muscle activity, which sometimes gets trapped in the muscle from physical, chemical or emotional stress. It is almost always tender and painful. When muscles tighten, their function and motion are restricted, causing weakness, pain, and sometimes muscle cramping. Trigger point therapy is specifically designed to alleviate the source of the pain through cycles of isolated pressure and release. 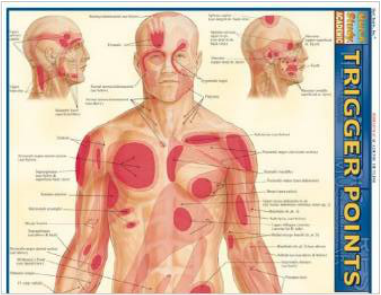 In this type of massage for trigger point therapy, the recipient actively participates through deep breathing as well as identifying the exact location and intensity of the discomfort. The results and benefits of trigger point therapy are releasing constricted areas in the muscles thus alleviating pain. You can experience a significant decrease in pain after just one treatment. Receiving massage with trigger point therapy on a regular basis can help naturally manage pain and stress from chronic injuries.